Seeking a modular look with the sharp angles and minimalistic look? Our Southport 1400 Backless Cypress Outdoor Timber Setting features a soft blend of rough sawn and tongue and groove Cypress timber. Our Cypress timber outdoor furniture is fantastic for outdoor spaces. Our chunky Southport 1400 Slat Back Cypress Outdoor Timber Setting is made using Cypress timber. Each piece of the set takes on its own beautiful character having been stained with a red tint to enhance the finish. Your guests will feel comfortable and relaxed. This square Southport 1400 High Back Cypress Outdoor Timber Setting provides a unique and versatile space for outdoor living. The huge table top rests on four x four rough sawn Cypress legs that resemble a square pedestal base. It is an ideal centre piece for informal dining, entertaining or relaxing. The Southport 1400 High Back Kwila Outdoor Timber Setting suit high traffic commercial applications. The Kwila timber tops have superb weathering qualities, able to withstand the elements, and the huge table top rests on four x four rugged rough sawn Cypress legs that resemble a square pedestal base. Add an umbrella hole, pop in a market umbrella and you have an island within your beer garden for guests to enjoy a leisurely afternoon altogether. Straight forward Southport 1200 Backless Cypress Outdoor Timber Setting is an ideal addition to any garden, or patio and robust to withstand heavy commercial use. The deep rich colour of Kwila used for the Southport 1200 Backless Kwila Outdoor Timber Setting tops gives a warm and inviting call to be seated. Besides that, the solid high back benches really do offer a comfortable seating area that subsequently allows guests to sit back and relax at an outdoor gathering. There’s certainly room to do so, even for a large group. The slat back benches of the Southport 1200 Slat Back Cypress Outdoor Timber Setting let the table speak for itself, and they are a popular seating choice; with simple lines, easy to clean and they enable more guests to be seated around the table than individual chairs. 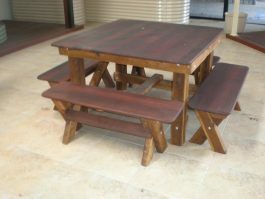 Southport 1200 Slat Back Cypress Outdoor Timber Setting is made up of our Southport 1200mm Cypress Outdoor Timber Table and four 2 Seat Slat Back Cypress Outdoor Timber Bench. You can sub out the slat back benches for our backless benches or have a combination of both styles – works out the same cost! This rustic style Southport 1200 High Back Cypress Outdoor Timber Setting is made using Cypress timber; guaranteeing that each piece is unique with slightly different tone, adding to the whole country look. These sets make great beer garden furniture – rugged, easy to maintain and robust. Because the benches are detached, you thereby have the advantage to use them for extra seating elsewhere in your outdoor living space. The Southport 1200 High Back Kwila Outdoor Timber Setting is a popular choice for commercial applications due to its rugged Kwila timber tops. Kwila, also known as Merbau, is one of the worlds most used timbers for outdoors. It has a rich dark red colour in comparison to the paler Cypress wood. Both timbers, finally and most note worthy, are particularly resistant to termites which many other outdoor timbers regularly are not.